We don't know if we'll see it at CES, but the typically reliable Evleaks has a new scoop about a Samsung Windows Galaxy tablet that looks a lot like the Surface. It used to be that PC makers were chasing Apple, but now they’re chasing Microsoft—at least when it comes to the Surface tablet. We’ve already seen or heard about Surface imitators from Dell, HP, and Lenovo, and now it looks like Samsung is getting into the game. The typically reliable (and supposedly retired) leaker Evan Blass (a.k.a. Evleaks) tweeted out renders of a new Windows tablet dubbed the Samsung Galaxy TabPRO S.
There isn’t much to go on about the purported new tablet other than a few concept images. Based on that, we have a basic Windows slate with front- and rear-facing cameras and a snap-on keyboard. Although it’s supposed to be a Windows machine, the image clearly shows an inheritance from the Android-based Galaxy line—not just in name, but design as well. Most notably, the TabPRO S features a squared off rear camera that Samsung is fond of using with Galaxy handsets. The fact that this is a Galaxy tablet is a little odd, since that name is associated with Samsung’s Android devices. Nevertheless, Blass insists that the Galaxy name is the real deal. 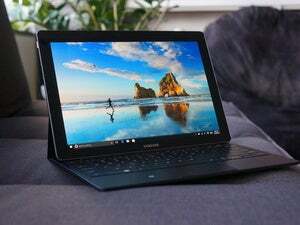 Perhaps Samsung is looking to trade in its established brand to improve the image of its Windows tablets, which are usually branded as Ativ devices. Rumors of a Samsung Windows tablet have been circulating recently. In late December, a 12-inch Windows tablet popped up in Wi-Fi Alliance certification documents, as first reported by SamMobile. Details for that device have since been scrubbed from the Wi-Fi Alliance site but are still available in Google’s cache. Rumored specs for the mystery 12-inch device included Windows 10, Intel Core M processor, 4GB RAM, and S Pen compatibility. It’s possible the TabPRO S and the mystery tablet are one and the same. The impact on you at home: Blass’ leak comes a few hours before Samsung’s big reveal at CES 2016 in Las Vegas. It’s not clear if the rumored TabPRO S will be part of Samsung’s annual trade show presence or if it’s saving the device for Mobile World Congress in late February—assuming we see it at all. Whatever the case, we’ll be keeping a close eye on Samsung’s keynote, which starts at 2:00 p.m. Pacific/5:00 p.m. Eastern on Tuesday.